Australia may not be the Final Frontier, but the first class cabin in Qantas Airways' remodeled A380 Airbus will certainly make you feel like it. Billed as the world's largest passenger airliner, the A380 seats anywhere between 525 to 850 people at once, and is infamous for forcing airports to refit their facilities just to service it. 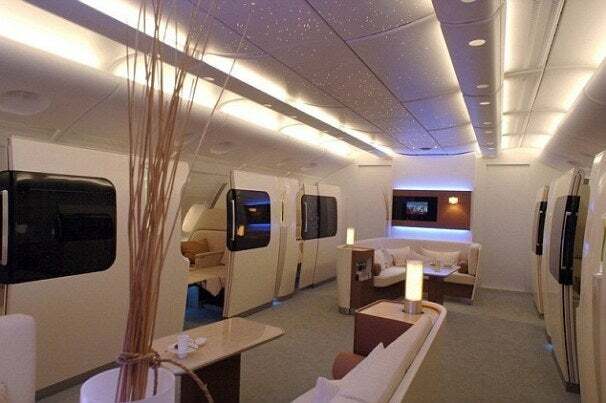 While the A380s have been in service for a few years, Tecca and the Daily Mail couldn't help noticing that the new first class cabin design looks like it's based on the Starship Enterprise of all things. As seen on Airbus' official A380 website, it's not a far-fetched claim. From the LCD touch-screen panels to the cream, tan, and brown colored interior, it's almost a total dead ringer for certain rooms in the NCC-1701-D from Star Trek: The Next Generation. Even if it wasn't an intentional reference (and we're sure it is), it's still awesomely geeky. Of course, there's no on-board voice-activated computer interface or force field-layered viewing windows, but the other perks are quite extravagant. Dreamt up by Australian designer Marc Newson, the cabin houses 14 individual portioned mini-suites, each with their own desks, entertainment systems, and lounge chairs that transform into single sheepskin upholstered beds. Entertainment comes by means of an touchscreen equipped LCD monitor that can display about 1,000 on-demand TV shows and movies. The common area outside the suites contains leather couches, a bar, plants, and even overhead lighting designed to mimic a star field. 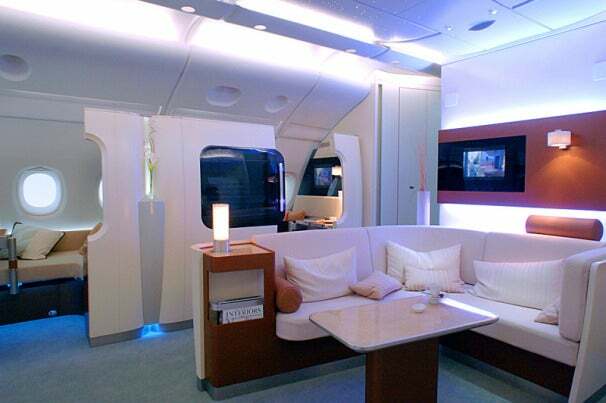 Considering that earlier versions of the first class cabin designs in the A380 lineup have looked disappointingly modern, anyone who finds themselves in the Newson-designed Enterprise cabins should feel lucky, provided they see the resemblance. If you want to get your geek friends and fellow Trekkies a treat during their next international flight, you'd better have several hundreds of dollars lying around for your vacation time. Qantas is "luxury" airline, and unless you're a local Aussie, those ticket prices will transport tons of cash right out of your bank account. Personally, we'd spend a fraction of that money on this Star Trek: The Next Generation Complete Series box set, and order enough pizza for a week-long marathon with our buddies instead. McKinley Noble is a former GamePro staff editor, current technology nerd and eternal mixed martial arts enthusiast. He also likes Japanese sports dramas and soap operas. Follow him on Twitter or just Google his name.